Howdy Coffeeholics ! This weekend we are working with the awesome Jakarta Highland Gathering Team to give back to the community. We will be auctioning 3 Voucher of our 30 Days of Kaffeine Privilege to all of you auctionista "yes we just made that up". The pass is valued at Rp1.100.000,- and it gives you free coffee for the next 30 days of your life! We all know that this powerful elixir is the extender of life for many, so why not join in and give the profit for a good cause ? We are excited to see you all at the festivity tomorrow! For some Bintaro Kids this is probably old news , but we are still proud!. Remember @desigrimaya's post from January? Well we have been chosen by www.qraved.com yes! Qraved! 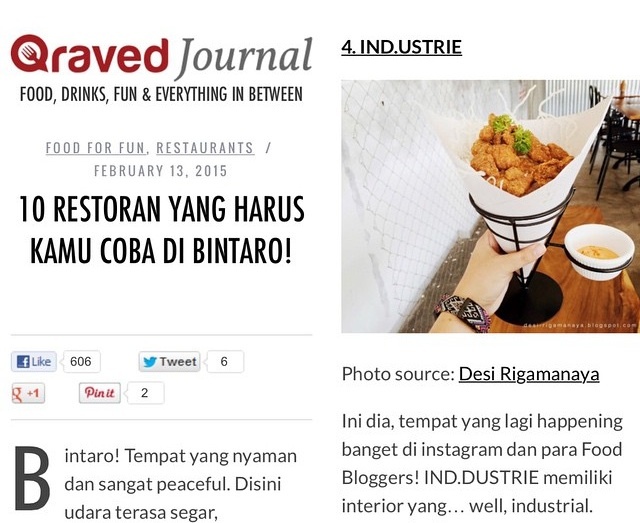 As one of the top 10 Must Visit Cafe in Bintaro. My oh My aren't we estatic! This is such an honour to have been placed among the much older and experienced establishment . We have none other than all of our loyal foodies to thank ; especially those who has been with us since day one. The IND.USTRIE team you guys are the best bunch of people to work with , keep up the great work!